"Dozer the JRT Free Bull Mastiff "
between him and Dad the guy said he had killed a deer and needed help with it. a dead deer dead weight yes but Dad wasn't buying that. this man hadn't killed a deer with just a knife. Dad had been target shooting so he had his rifle the man ran back into the woods.he was probably in them pretty deep when sheriff's from two counties showed up. Dad knew many cops our county sheriff told Dad we are going in after him. he looked at Dad and said sonny i don't have a dog to track this suspect. I don't know if you know this but "Dozer" yes I know her name. you got her from my mother and sister I trained that dog with the help of several k-9 officers. Dad said if she go's then I am going to they brought him out he had done some bad things to a woman in the next county. but the woman was okay.all the suspect had was a knife he was subdued and put where he belonged.the reason the sheriff had gave the dog to his mother well they soon found out during her training she wouldn't hurt a woman or subdue a woman she also loved kids. now she would go after a woman over a kid as well as a man. you couldn't spank a kid around her.she done many amazing things in her time. but to all great animals we must say goodbye her hearing became dull around 1988 it became a little harder for her to get around. 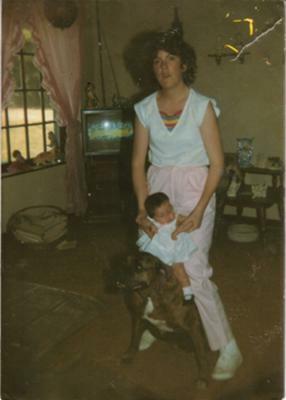 in 1989 my sister came back to the farm and me and mom agreed she could take her home with her. I was now 12 years old I guess Dozer was around 14 then. my sister had her about a week the way I understand it she showed love and compassion and as much protection until the end. like I said she had her one week she called the vet he came out she asked him do you think she is suffering bad enough to put her down he replied no! if I were you I would let her go on her own.one day after a short walk she started shaking as she lay in my sisters lap she looked down and said oh Dozer.she used what strength she had and raised her large massive head and licked my sister took in her last breath and breathed it out and the big massive Dozer was gone. she had loved and protected us until the end. according to the vet she had a stroke. and after many years as her vet even sis said he held it in well but a tear ran down his face. had many other dogs since but I will never have another like her I HOPE YOU LIKED THIS STORY!!! !